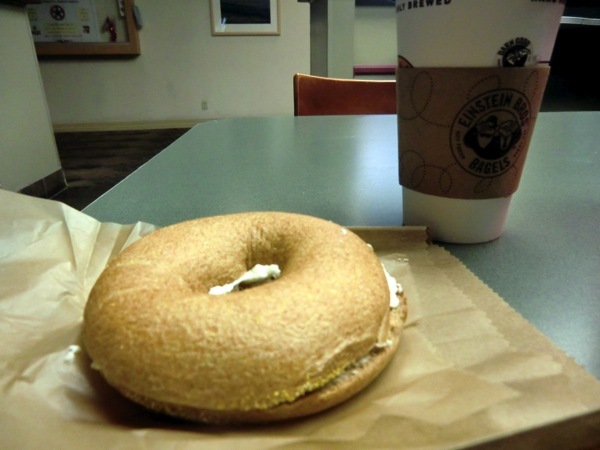 This morning started off right with a 100% honey whole wheat bagel with a light amount of reduced fat – light “schmear” and a vanilla hazelnut coffee (black). If you haven’t smelled that coffee it is seriously amazing… everyone I work with was raving about how good it smells! 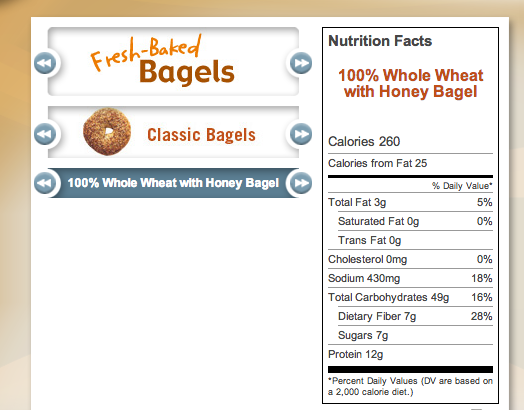 Whenever I know I’m going to eat out I like to look up the menu/nutrition facts before so I can be prepared to make a healthy choice 🙂 Like many whole grain foods this bagel had lot’s of fiber and protein which kept me super full until lunch! Unfortunately though the reduced fat- light cream cheese is less impressive. For 1.25oz it has 80 calories, 6g Fat, 4g Carb., 2g fiber, and 3g protein. My guess is that they use more than that (even though I asked for less). I definitely enjoyed it A LOT… but I usually prefer a Southwest Turkey Sausage Bagel Thin Sandwich. I got the bagel because I thought I had a free coupon… turns out the hospital locations don’t take coupons. Of. Course. But that just means I get to use them this weekend! Hooray, more Einstein Bros! Obsessed? Absolutely. When lunch time rolled around I was still pretty full from that wonderful bagel and amazing coffee, but I knew I needed to eat enough to last till I was done (5 hours later). I made a salad from the bar with romaine lettuce, cherry tomatoes, strawberries, carrots, cabbage, cucumber, about a tbsp of feta, tbsp of raisins, sprinkle of sunflower seeds and cubed chicken. 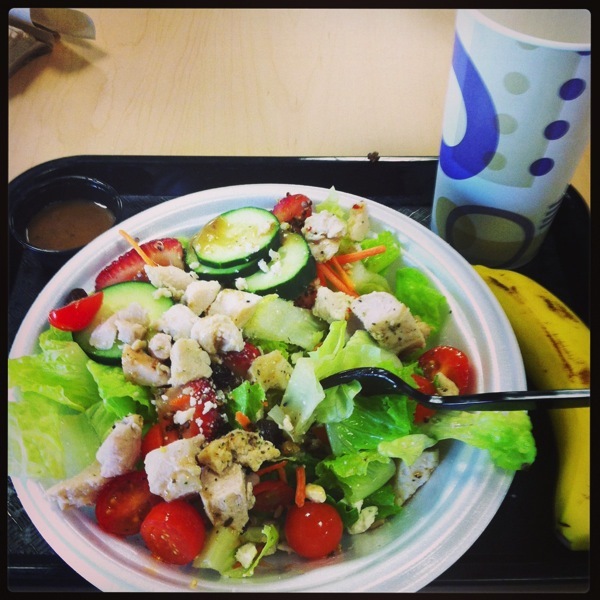 On the side is balsamic dressing. In the cup is diet sprite mixed with diet lemonade. Since I wasn’t that hungry I needed some carbonation! I didn’t eat the banana till I got off work. Glad I had the banana because I then spent an hour making life decisions at the Verizon store (my iPhone officially died today). My Fiance Paul (on the phone) and the guy working there were VERY patient during my full hour of indecisiveness. Final decision? iPhone 5 🙂 I’m all up to date now, for about 5 minutes till the next thing comes out… I’m not very technology savvy as you might have guessed. Just finished dinner, Easy Southwestern Omelet (recipe to come) and about to head out to the gym! What’s the longest time you’ve spent trying to decide on an electronics purchase? Have you ever had your coupon rejected? What did you do?